Conversation in the Cathedral (translated by Gregory Rabassa) has absolutely nothing to do with big churches. The cathedral of the title is a seedy bar, where two of the main characters, Santiago and Ambrosio, go to catch up after a chance meeting. The two men have a shared history, but they are very different people – as will become evident over the next six-hundred pages. “Are you serious or joking?” the Lieutenant asked. “Did my old man know you were there?” Santiago asks. “Did that happen to you with Amalia?” Santiago asks. The book is divided into four parts, and each looks at a different period of time (even if the chapters tend to jump backwards and forwards in time). Each introduces new characters, many of whom then fade into the background. After 100 pages, we are obsessed with Santiago’s university time and his communist leanings, eager to learn more about his friends Aída and Jacobo – by the end of the book, they’ve been forgotten (like mnay good university friends…). One of the main characters is Cayo Bermúdez, a non-descript, half-breed merchant plucked from obscurity, who becomes one of the most powerful and feared men in the country in the 1950s. Having eclipsed the General who recommended him to the President, he goes about consolidating the regime’s grip on power while amassing a fortune, keeping a mistress and ruthlessly crushing all attempts at insurrection. Oh, and did I mention that Ambrosio is his chauffeur too? 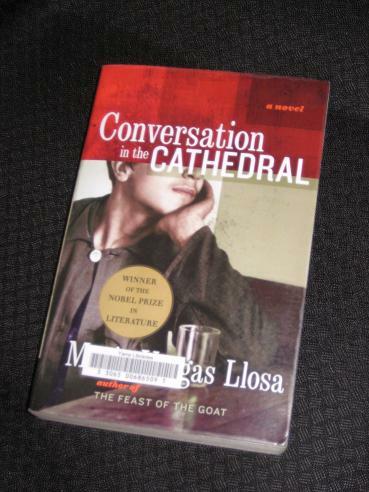 Conversation in the Cathedral is an excellent novel, and one which has (mostly) restored Vargas Llosa in my eyes. Like The Feast of the Goat, it’s a book concerned with history and politics, but it does so in a much more elegant and interesting manner. Rabassa’s translation is excellently unnoticeable (if you think that’s a good thing! ), allowing the reader to immerse themself in the story without stumbling across clumsy expressions. While I don’t think the writer manages to hold the tension right up to the end (I thought it was just that little bit too long towards the finish), he still does a good job of making the reader want to prolong their stay in the semi-fictional world he creates. I'm so glad you liked this novel. I'm sure you'll still become a big Vargas Llosa fan. I think this was one of his hardest novels, and I had to struggle to read it at first, but then it turned into a gripping story. If you've survived this one, the rest will be pretty easy. You should read “The green house”, which is more complicated and equal entertaining and you will learn something about peruvian jungle.